Considering a garden extension? 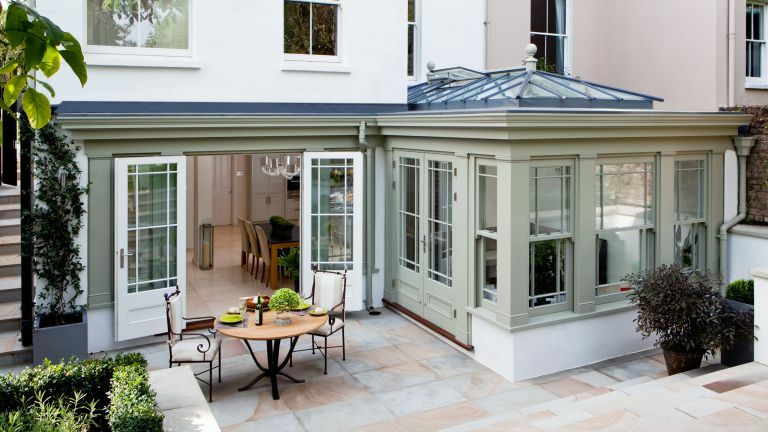 If you like the idea of a conservatory but want a more solid structure, consider an orangery. Here's how to get your orangery project just right. Introduced into the UK from Italy in the 17th century, orangeries reached their height in popularity during the 18th century. Embodying classical principles of symmetry and scale, they were built for the wealthy to house exotic plants such as citrus fruits, rather than as a sitting room. to-ceiling windows and a lantern roof, as well as details such as columns, pediments and fine glazing bars. Orangeries are not only suitable for Georgian homes but properties where balance, symmetry and scale are in evidence. What's the difference between an orangery and conservatory? Typically more substantial in its proportions than a conservatory, with, at the very least, a partially solid roof with more brickwork and full-height brick pillars, it will still give you wonderful views over your garden. A conservatory continues to be seen as more of a garden room, with large amounts of glass, and is often separated from the rest of the house by external-grade doors – although contemporary constructions are thermally efficient enough to be open to the rest of the house, just as glazed extensions would be. Orangeries, whether traditional or contemporary in style, have all the advantages of a conservatory – tons of daylight and views over the garden – but, from the inside, feel more like a natural continuation of the architecture of the original house. Costs for orangeries depend on the complexity of the design and materials used but, as a general rule, conservatories cost from £10,000 upwards, while simple orangeries cost from £20,000 upwards. Expect to pay an average of £40,000 for an orangery. This is because the construction work is more substantial than that of a conservatory and the labour is similar to that required of a single storey extension. As with any home improvement project, you could spend even more than this depending on the size, materials used and the complexity of the design. Does an orangery need planning permission? Don’t extend beyond the rear wall of the original house by more than four metres for an attached house or six for a detached. How do building regulations affect orangeries? Part L1B of building regulations states a limit to the total glazing in a property to 25 per cent of the floor area. However, if you can demonstrate compliance with thermal requirements using any amount of glazing, the building will be regulations compliant. A structure that is closed off from the rest of the house with external grade doors is exempt from building regulations in most circumstances. What if you live in a Conservation Area or listed building? Within designated areas – including Conservation Areas – you may need to apply for planning permission for your orangery even though you wouldn’t have this obligation elsewhere. Local authorities can also remove some permitted development rights with Article 4 directions. If your home is listed you will need to apply for listed building consent. If planning permission is needed, it is more likely to be granted on structures at the rear of a house. Many planners are now particularly receptive to contemporary frameless additions that offer a distinct separation between old and new. As with all additions, success relies on a sympathetic reflection of the main property, in terms of scale, architecture and proportion. For more information, visit the Planning Portal and contact your local authority to check the specific details of your project before you start work. Orangery additions to older homes must be sympathetic to the house’s period and architecture, meaning a bespoke design is always going to be the preferred option. But even if you choose an off-the-peg design, you can get a successful finish by ensuring the design is in proportion with the existing property and pay close attention to details, such as the roof pitch, bargeboards, finials, windows and colours. Matching new brickwork as closely as possible to that of the original house will help your orangery blend seamlessly, will choosing window frame styles and paint finishes that complement those of your existing home. First, you need to ensure that the flow between your existing home and the new extension feels natural. This means defining the orangery’s purpose early on; its use can then dictate the room’s shape, proportions and size, how much solid wall space is needed – and how and where it’s accessed from the original house. Ideally, floor levels from the existing building into the new orangery – or conservatory – should match, too. Orangeries tend to be constructed with a greater proportion of wall elements and partially-glazed roofs, the advantage of these design elements being that it is easier to place furnishings, such as kitchen cabinets, within the orangery itself. Perhaps the main attraction of an orangery is the connection it creates with the garden. Most period-style additions will open out to the garden through French doors, but bi-fold doors are popular for more contemporary orangeries as they can stack to the side to allow for a wider opening. Consider whether the conservatory will step down to the garden or be on a more level threshold, with direct access to decking or a patio area. If the latter, mirror the flooring inside and out for a greater flow. Maximising daylight and views over the garden is also vital, so whether you’re planning a contemporary or traditional-style orangery, consider slim sightlines for the majority of your glazing (more on that below). For traditional-style orangeries, French doors – perhaps on more than one side of the room – will fit stylistically; for more contemporary structures, consider folding doors that will open the room right out to the garden. In both cases, flush thresholds will make the transition from the house to the garden seamless, helping you create the perfect indoor outdoor room. If your orangery is part of bigger renovation project, a conversion, or self-build, it is advisable to find an architect that has some experience designing properties that incorporate orangeries in your area. They should be able to advise on what the local planning office is likely to allow and help with any planning applications. The latest frame solutions for orangery doors and windows include much narrower timber, aluminium, composite and uPVC frames, which allow for more glass and better views of the outside, and can include bi-fold or sliding styles. But which material is best? A commonly used material for conservatories, PVCu is more affordable than the alternatives, widely available and maintenance free. However, it is not the best choice to complement a period home as the material tends to result in bulkier, inauthentic sections and details. Traditional glass houses had metal frames, and aluminium is still a popular choice for its classic looks and slim sightlines. It can also be used to cast more ornate designs, similar to the orangeries of the Georgian and Victorian eras. Modern aluminium frames include thermal breaks to avoid heat loss, and can be powder-coated in any colour to produce a maintenance-free addition. Timber frame is the alternative desirable option for a period home. Oak-framed orangeries look stunning and if unpainted the wood will weather beautifully. Other popular timbers include Douglas fir, sapele and Accoya, which is modified to be incredibly durable and resistant to fungal attacks. Ensure that wood is factory painted or treated, which will make it rot resistant and mean it should last around 10 years before requiring any maintenance. For the best of both worlds, some manufacturers offer composite orangery frames, which have an aluminium exterior, great for low maintenance, and a timber interior, for warmth. IQ Glass' Carminati Skyline lift-and-slide doors have a super-slim 37mm vertical frame, the world’s slimmest timber doors. Available in fir or oak with a laminated timber structure for additional strength, beauty and performance, these doors can come as double- or triple-glazed. The patented base track is designed to be flush inside to outside, with a unique sliding track cover for when the doors are open. This creates a flush internal to external base detail with no track indents. This also means the sliding tracks and wheels are never fully exposed, providing a long life expectancy. These lift and slide doors have extremely high levels of thermal insulation due to the timber, with Uf values as little as 1.2 W/m2k. particularly for the roof – will ensure the temperature of your space is comfortable year round. Low-e glass with an argon-filled cavity is a good option – it has a thin low-emissivity coating to reflect heat, while the gas in the cavity greatly reduces the transfer of heat. Other types of glass have coatings to reduce the sun’s rays and stop the orangery overheating; try Roof Maker's, which also retains heat in winter. Pilkington has several options, including Cervoglass, an insulated glazing product that protects against both temperature extremes. Another option is self-cleaning glass, which helps gather dirt so that it simply washes away when it rains. Bear in mind that when glass is treated it can lose some of its clarity and take on a slight tint, so take a close look at the options available and choose one that’s as clear as possible. For the greatest clarity and maximum light, look at low-iron glass. With so much glazing, security could be an issue, but glass in orangeries should be toughened up to a height of 800mm, or up to 1,500mm for glass doors. Any quality glass roof should also feature toughened glass as standard. Using the space all year round will really only be an option with the right glazing and a ventilation and heating system that makes the room comfortable. Just as with conservatories, solar-control coatings will reduce heat build-up, while low emissivity glass, and double- or triple-glazing will keep the room snug in colder weather. For heating the space in colder months, underfloor heating is usually the best option as it takes up no wall space. Trench heating, a warm-water system sunk into the ground with a grille on top and running around the perimeter of the room, is another possibility. A wood-burning stove can be a stylish focal point in a glazed extension. For ventilation, consider incorporating panels into the roof lantern that can be opened – solar or automatic controls are more practical than manual ones. Automatically-controlled vents can also include rain sensors. Other solutions include mechanical fans mounted within the roof pinnacle, passive trickle vents within the roof ridge or opening windows within the vertical side frames of a roof lantern. Unite the space to your garden with clever landscaping and lighting. Planting around the building can soften its edges from outside. As for outdoor lighting, ‘Illuminate something beyond the room itself – such as the garden – as this takes one’s eye out beyond the glass. Ideally, light some planting close to the glazing and then something beyond,’ advises Sally Storey, creative director at John Cullen Lighting.